We've already seen plenty of tiny medical devices that patients in need of diagnoses swallow to receive video and photos of their insides but this is the first robot we know of that actually goes to work on the human body from within. 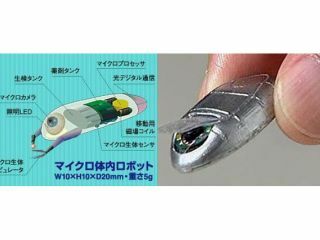 Teams from Japan's Shiga and Ritsumeikan universities have developed a miniature prototype device, whose name loosely translates as 'Internal Micro Robot', that is just 1cm in diameter and 2cm long. The dimensions are small enough to allow the insectoid-looking machine to enter the body through a surgical opening in the skin and burrow deeper with minimal invasiveness. Operators control the robot's position using external magnets, while a thin attached cable delivers two-way data and instructions. The theory - although animal trials are as far as the researchers have tested it so far - is that cutting devices attached to the robot can take biopsy samples or a drug can be delivered precisely where needed. If all goes well in future, it seems likely that remote-controlled robots will become as commonplace in treating internal ailments as laparoscopic surgery is these days.